A search function may be found at the upper left corner of the top page or appears at the left side of menu bar in all pages. 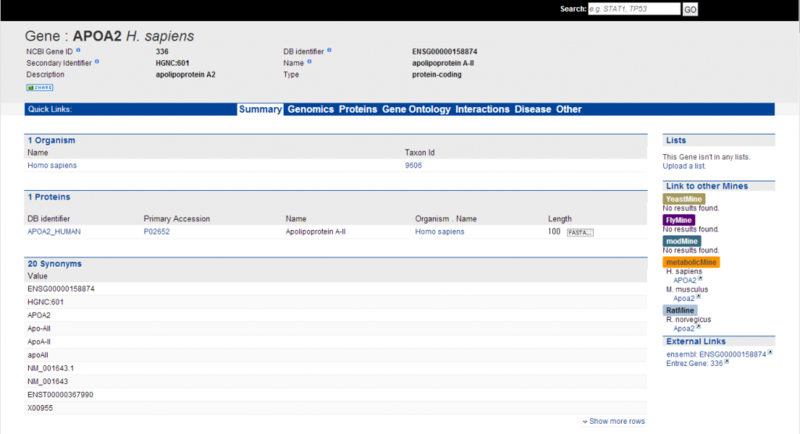 A user may enter any text (such as a gene name, identifier or a keyword) in the quick search box to search for the related content in TargetMine. The search box could be found at the top page or the menu bar. Please note that you have to add an asterisk (*) for searching the partial matches. The search results may then further be filtered using different features. The results can be filtered by the facets at left. Click on the entry id to see the report page. Clicking on the search result will direct the user to the report page for that object. The report page for a particular object in the TargetMine database provides all the stored information for that object. All report pages have the same basic structure. Here is an example. An example of the report page (partial).